Time Capsule, Westminster Presbyterian Church, Durham, NC, 2013. Alex Denson of Westminster Presbyterian Church  in Durham, NC, contacted me months ago to ask if PHS had any advice on the process. As Alex said, "everyone who does a time capsule is a novice, because you only do one in your life. To the extent you can pass along lessons learned, new people can begin with that as a reference." Although PHS strongly discourages churches from encapsulating the kind of unique records and personal papers we safeguard in our facility , we love how time capsules help congregations reflect on their accomplishments and feel excited about all they can achieve in the future. It's in that spirit that we wanted to share Westminster's experiences with our readers. 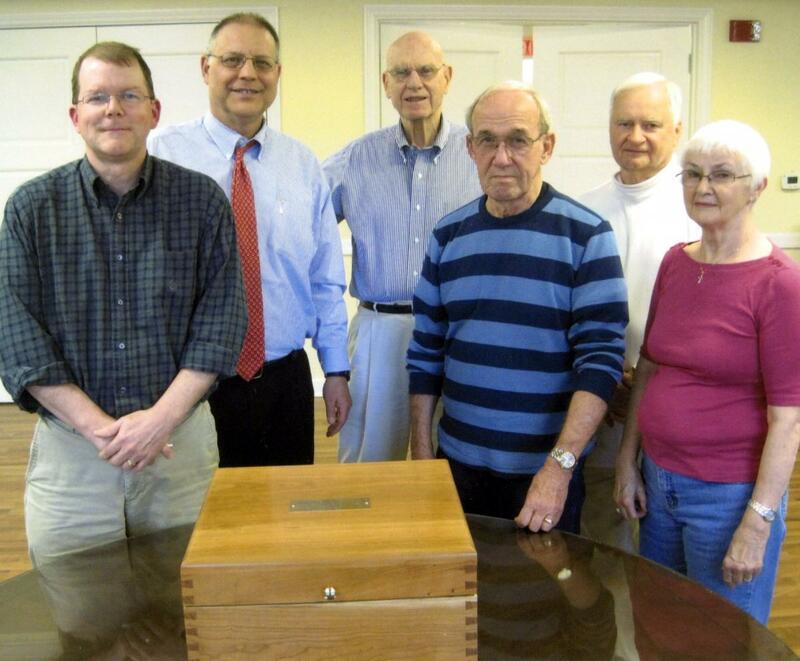 To commemorate its 50th anniversary in 2013, the church created a Time Capsule Committee. Bill Stokes, a long-time member of the community, was designated committee chair and tasked with coordinating all involved efforts. Ralph Coonrad, one of the founding members of the church, was invited to give authority and perspective to the project. John Dancy , a former NBC senior correspondent, was tapped to write an introductory piece discussing the state of the world in 2013; his wife Anne Dancy was charged with preserving photographs. Alex Denson would plan the physical capsule, including its creation, encapsulation, and management. Blair Chesnut, a computer expert, would prepare the electronic copy of the time capsule. Time Capsule Committee, Westminster Presbyterian Church, Durham, NC, 2013. Documents for inclusion were printed on acid-free paper and photographs placed into archival sleeves--steps meant to ensure that printed materials will not yellow or crumble over time. A beautiful cherry container, hand crafted by church member Dr. Morris "Pete" Jones, was chosen for the encapsulating vessel. After materials were placed inside, the box was surrounded with two bags, designed and sewn by Mary Denson, Alex's wife. One bag was made of soft cloth meant to protect the wood from scratches, another from a more durable canvas to prevent wax seepage. Those enclosures were then placed in a slightly larger metal container fabricated to spec. Lastly, a one-inch space between the wooden box and the metal box was filled with paraffin wax--a barrier against three of the four aforementioned horsemen. 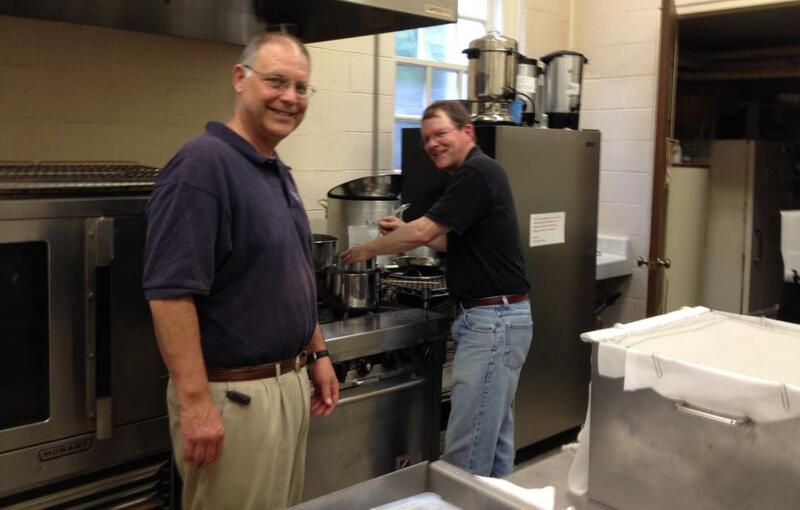 Preparing the paraffin, Westminster Presbyterian Church, Durham, NC, 2013. When the committee members began the project they intended to place all the items in a metal or concrete box that would then be buried. They changed their collective minds after researching the matter further and learning that buried boxes sometimes fall prey to the elements. Worse yet, the hallowed time capsule ground can be forgotten about and built on. In the end the committee decided to place the time capsule in a lesser-used closet within the church. But can't a closet be forgotten about, as well? Yes--though that's not likely to happen at Westminster. The committee had the foresight to write into the job description of the Clerk of Session that she or he must keep track of the time capsule and report its location once a year to a supervisor. Being a digital archivist, I was particularly excited when Alex mentioned his church's electronic time capsule, which allowed the committee to include many more documents in a variety of preservation-friendly file types. In addition to digitizing most everything that went into the capsule, the committee asked staff and church members to submit documents (sermons, letters, remembrances, etc.) as computer documents, mostly using MS Word. (For paper and photo originals, they made electronic scans.) To make sure there were plenty of reflections to digitize, the committee even created a survey that queried church members about their memories of the congregation. Originally, the committee members had planned to produce two copies of the electronic files--one held on physical media (CD, DVD, or USB memory stick) for storing inside the time capsule box, and a second copy for outside the box. They scrapped the physical media idea when they realized that the electronic readers needed for each media might not be available in fifty years. Instead, after Blair and John consulted Kara Pearce, Westminster's Communications Coordinator, they opted for web-accessible "cloud" storage. Using a combination of Google Drive and DropBox, they also stored a ZIP archive of the files on the church's local network. Again, they formalized the stewardship of these electronic files into a job description, in this case that of the Communications Coordinator, Kara Pearce. She, or future time capsule stewards, will access the files on a scheduled basis in all of their storage locations, thereby confirming their existence. The steward will also monitor the status of the file formats used--PDF, JPG, PNG--and arrange for file conversions, if necessary, to make sure each can be accessed mid-century. Regarding the cost of the project, the Westminster team found that prices for professional archival materials on-line were astonishingly high. Wishing to be wise stewards of church funds, the committee members searched locally and found that acid-free paper could be obtained at office supply stores and archival-quality photo sleeves and block paraffin at craft stores, all for reasonable prices. Rev. Dr. Chris Tuttle, the pastor of Westminster Presbyterian Church in Durham NC, sits next to their recently created time capsule commemorating the church's 50th anniversary. Westminster Presbyterian Church has concluded their time capsule project. As Alex said, the members of the committee will likely never create another one, and might not be around to see this one opened in 2063. Will their efforts pay off? Only time will tell. Still, I'm betting it will be a wonderful unveiling when the contents are removed from the cherry box and the letter from the Time Capsule Committee read aloud for the first time, thanks to the forethought, planning, and execution of Alex and his diligent friends.